These attractions are located not far from the area of ​​government offices in Batam and are in the area Bengkong Sadai Batam. 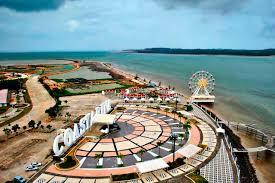 Ocarina offers a variety of entertainment such as the water park of modern tourism and beach tourism model is similar to Ancol tourist attractions. This tourist place a lot of objects to berselfi ria, many statues sculptures made by information and quotes that add historical impression. Visitors also can see the view of Singapore's Urban who are overseas and this is usually often made fun berselfi background while riding rides rotate when it is active. Especially for Waterparknya own means in it is very attractive, comfortable and clean. But here are not suitable for adults because the water was shallow so it is more suitable for children aged under 10th. Often some kindergarten or elementary school doing outdoor activities in Ocarina Park Batam. Advice when you visit here with the family should bring their own lunch snacks because here rarely sold snacks mainly for the consumption of children.